Construction sites are more than just big trucks, heavy tools, and dirty boots. From creating a sales pitch that brings clients in, to keeping your clients happy with visual updates, and giving your workforce additional data to keep the project on-track – the rapid development of drone technology and applications, the construction industry is being impacted in every possible aspect. Projects of any size require planning – and the larger the project, the greater the importance of those plans, or else the entire project will be fraught with delays and higher costs. When a team decides to start using drones in the construction process, they can bring in valuable data from the start of the project and better inform the people involved in the planning. The use of drones in construction gives you the freedom to replace traditional surveying assets – manpower, heavy equipment, etc. – with a remote controlled (or automated) UAV that can photograph, scan, and take different kinds of measurements. The same data (aerial photographs of the job site, terrain scans to build 3D models, imagery to show different temperature or chemical hotspots, and more) can be gathered in less time with UAVs and save the resources that used to be allotted to pay a human survey team to do the same work. Working in construction means that you’re almost always working for a client. From the moment your company is approached with a possible contract, you need to provide clients with visual data that not only shows you what you can do for them and help you sell your services, but to update them throughout the project. The advantage of using drones in construction means that you can send your survey unit to the client’s piece of real estate, take the necessary photos and scans of the area, and then get that data to your sales teams to create the best, visual materials possible to secure the contract. 3D renderings of what a potential client’s new headquarters will look like from different angles and elevations are excellent ways to help them see what you can build for them and can make the difference in getting a handshake or being told that they’ll get back to you. With a plan created and an anxious client waiting for the final product, the use of drones in construction can help you keep tabs on what’s going, keep your project on-track, and feed the client satisfactory updates. With UAVs as a tool for your various sites, it affords you the ability to do flyovers and scans of sites and have that information sent to you while you’re off checking out other locations or dealing with a delay elsewhere. Additionally, the same drones can send you imagery of areas that might pose a safety risk or even go as far as making sure that your workforce is on-task and the project is progressing on schedule. When it comes to the client’s need for updates, a quick flyover of their job site prevents emails or phone calls from them asking you how the job is going. Scheduled update runs by a UAV can also help prevent the need for them to stop by the site and potentially delay workers (or even create a safety issue). Drone construction inspection is more than just making sure that the buildings aren’t on fire – it’s also about providing updates to the client and yourself. These updates can be done by the same drones and fly the exact same, pre-programmed flight paths for continuity and a better sense of progress. The usefulness of a UAV doesn’t have to be limited to simply taking photos to help get clients and to keep them updated. Drones used in construction can also be utilized to help make sure that the job site is safe and secure when your workforce has gone home for the evening. Security teams can use drones to do sweeps of the job site and cover more ground faster than a walking person and more covertly than someone using a motorized vehicle. Equipped with different cameras to view designated areas with features like night vision and thermal/infrared; and audio equipment that can even recognize the difference between a gunshot and an explosion, security teams can operate more efficiently and have a better idea about what’s out there, instead of being sent into a location totally blind. Adding construction inspection drones to your team’s tools will only bring benefits and will drastically improve your ability to view challenges, inspect progress, and assess the overall status and situation of any work site. 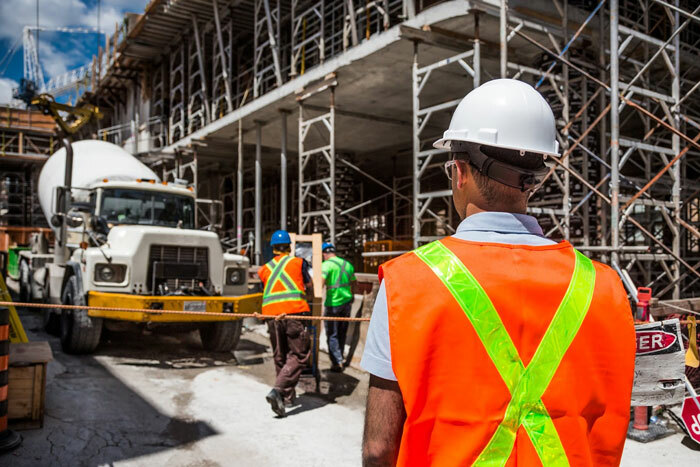 Having real-time data and a view of a site is the best way to come up with the correct solution for dealing with a delay, handling a safety issue, and making sure that a job is completed. UAVs increase how quickly you can have eyes on something – no matter how far or high – and also have the added safety benefit of being able to send in a machine into areas that might be dangerous to a person who is going in blind. By exploring the use of drones in construction, a company is opening themselves up to a valuable resource that will change the way that you quote, plan, and complete projects. With practice, certification, and experience using UAVs on-site, a team can truly increase every aspect of the construction process.